Embattled Senate Majority Leader Harry Reid (D-NV) attempted to get the Senate to vote on the SCA and a series of other related conservation legislation last night, but Republicans blocked the move. 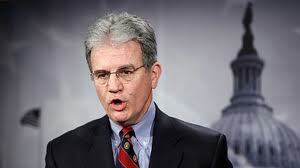 Republican leader Tom Coburn (R-OK) objected to these votes. Updating existing policies to close loopholes is “growing the federal government”? Really? None of these laws give the government any significant new power. They modify existing authority to make it actually function. Updating such laws is extremely common. The deficit is indeed a problem, and I agree that our elected leaders should focus on it. However, it’s not the only problem, and it’s absurd to claim that we should abandon everything except trying to fix the deficit. The United States government, though far from perfect, has been a world leader in conservation legislation for decades. We can’t abandon these worthy priorities just because we have other problems as well. It is worth noting that Harry Reid has a mostly-correct understanding of shark finning. I think that he meant to say that “they don’t die quickly” and not “they don’t die”, but still, I’m pleasantly surprised that the Senate Majority leader got it mostly right. I would like to thank Dr. Coburn, for continuing to make it clear that despite all of the failures of the Democratic party, voters who care at all about the environment really only have one choice in our elections. Should South Carolina’s public colleges freeze new construction projects to save money? This is a particularly bad season to get any legislation past,I like the suggestion this gets shelved until after the mid terms. I’m so sick of hearing soundbites featuring people like Mitch McConnell using things like “the politics made them do it,” when the GOP blocks really good legislation, like these conservation bills, the 9/11 relief worker fund and the bill to increase taxes for companies that ship jobs overseas. I’m just astounded that polls aren’t saying that the public is ready to give control of the Senate to the Dems. Sam, the Democrats have controlled the Senate for years. I know it doesn’t seem that way because they haven’t done anything and the agenda still appears to be set by Republicans, but I assure you that it’s true. No, I know/knew that. I mean 2/3s majority control. Again. Pre-Scott-Brown majority. You know, so that the childish posturing and whining (which, admittedly, will always and has always gone on) which has gotten so bad of late will stop. Like I said, I’m sick of hearing Mitch McConnell reaming out a perfectly good bill because he wants to be re-elected. Part of it is that man doesn’t do logic well when it comes to what he says, the other part is that he’s got a really annoying voice. Always boggles the mind when politicians spend time saying that some piece of legislation is wasting time and drawing focus away from some other law… when they could do the right thing and support it! Reach out to your Senators (as a lowly DC resident, I can’t) and tell them where you stand on shark finning. This is an interesting point you make Shiffman, Coburn shut down what on the surface appears to be some pretty commonsense legislation. It is hardly ever a popular move to vote against sharks, cranes and rare big cats. What I don’t get and what the Hill doesn’t really clarify is the exact nature of his objections to the bill. How much will it add to the deficit? Why? Could the bill be drafted to close these loopholes without spending so much money? What new federal authority does it create specifically? How many earmarks were attached to the bill? I don’t think Coburn objects to closing loopholes to more effectively stop shark finning in American waters, I think he objects to the way it is being done. But alas we can’t have that debate because there is no information available. Does anyone know the answers to the questions above? what way is that? I don’t understand what you mean here. As far as I can tell, none. Closing loopholes does not constitute new power, it is clarifying previously-existing power. You are interpreting this as the media mis-portraying an honest guy. I’m interpreting it as a politician attempting to score points with his increasingly rabidly conservative base by railing against “liberal special interests” and “expanded federal authority” regardless of if there actually is any expanded authority. This is in keeping with recent revelations that Coburn is the one behind our not keeping our promise to provide $1 billion in aid to Haiti- he cares about pretending to stand for principles, he doesn’t care about who gets hurt in the process. Economic policy and either the Republican or Tea Party offshoot would appear to be an oxymoron. Their “policy” is a state of mind: “B****r you Jack I’m. all right!” It might also be summed up as the selfish pursuit of personnel wealth at the expense of their fellow souls, the animal kingdom and natural environment! All of course aided by corporate interconnection, lies and unscrupulous nastiness. The UK Conservative party is mild and innocuous by comparison! hey, its all to complex, by our own design. In this wourld, humans were givin dominion over the earth and all life on it, mainly because we are all part of the same thing and we were created with reasoning ability… the only species to have it here on earth… It was not to profit and have and have and have, REGARDLESS of the rest. It was to give. In order that ALL may have. How many Trillions Does a complex entity require, simpler is better. It also goes Further. Its time NOW to wake up, prioritise and refocus, were we are going is a result of were we where. New thought and THE APPLICATION of its action produces the new result. WE whom elect and empower the leaders to represent our ideals and ….. START WITH REMEMBERING OUR PURPOSE AND NOT BE-ING OUR UNCONCIOUSELEY SELF CREATED INDEPENDANT PERSONALITIES. Its time for reform, and it all starts with YOU NOW! Then we can re-create and end this degredation and waste of all there currently is….Left. MASS CONCIOUSNESS of our highest intention and expectation for all is required, the greatest Visionarys succumb and cannot lead alone. Carl Dekker, brain cancer survivor and Pre-scent. Can you explain one thing to me, as I am not American. Does this mean the legislation will never pass, unless Coburn decides to stop blocking it? Or will/could it get passed at a later stage by a majority vote? If it means that the legislation is blocked forever, and that it will never pass, then I can only come to the conclusion that America does not even actually have the semblance of a democracy. As far as Coburn is concerned he seems a despicable person who has no concern for anyone or anything but himself and the pawns who fawn over him. This is a little confusing and the initial article doesn’t clarify. I’ll fill what I know but I’m not sure which of these is the reason. In the Senate, one member has the ability to filibuster, which prevents the rest of the Senate from voting unless 60 members vote to stop the filibuster. I don’t know if Coburn was threatening to do that or not, I would assume not. It’s more likely that Coburn is merely the spokesperson for a group of conservative Republicans, and it was implied that none of them would vote for the bill unless his concerns were addressed. This argument has nothing to do with whether Republicans are for or against shark fining. It has to do with fiscal responsibility. If Reid had introduced legislation that would have paid for these initiatives then they would pass. We have a huge problem here with our budget deficit. Adding to this problem is fiscally irresponsible. Let’s hope this issue gets adequately addressed after the mid-term elections next month. The Shark Conservation Act had almost no associated expenses. It was an update to an existing law that closed loopholes.